Save $1.50 on both items! SAVE $1.00 on ROR and a Microfiber Cleaning Cloth. This is a great deal - it includes both a 1 oz bottle of ROR (enough to last MANY years!) along with a microfiber cleaning cloth designed for optics. As with any lens cleaning, first blow away any loose residue from the lens. This will help assure that there's nothing abrasive on the lens before cleaning. 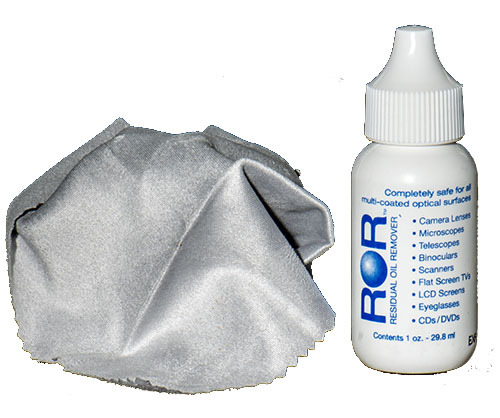 We then recommend you put ROR on a clean microfiber lens cleaning cloth. Note: We recommend washing and drying new micro fiber cloths before using for the first time and we DON'T recommend putting ANY lens cleaning solution directly on a lens as the liquid may make it's way between the glass and the lens mount, loosening any adhesive material used in the manufacture of the lens. Gently wipe the cloth in a circular motion starting in the center and working your way towards the edges.